Sydney performed on Show 249, recorded in March 2012, at age 15. 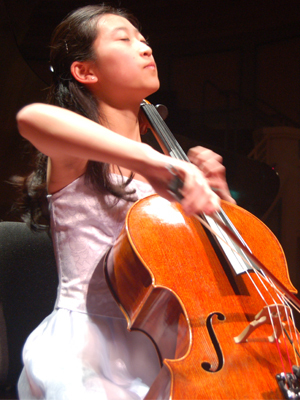 Sydney Lee (cello), 15, lives in Oakland, New Jersey and attends Valley Middle School. She is a student at Juilliard Pre-College, where she studies with Minhye Clara Kim. Sydney is a member of the World Youth Alliance Chamber Orchestra and the Juilliard Pre-College Symphony. Sydney has attended Meadowmount School of Music and the international MusicAlp festival in Courchevel, France. In her free time, Sydney is active in her church youth group and enjoys shopping, hanging out with friends, and traveling.